Bike advocacy in the UK has been the perfect pastime for depressed optimists. A cycle of cresting waves of possibility constantly dashed against rocks of, meh, disinterest. A match made in a manic hell. Right now, sat at this window on the virtual world, I’m just a click away from more cycleliciousness than you can shake a camera at. For the price of a ferry ticket I can nip across the North Sea and bike around in an actual, physical, real world, working model of the nearest thing there is to bicycle utopia on earth (btw the brilliant bike bridge in that video was designed by a british company). And I have. I’ve been there. I’ve seen it. It’s not just possible, it’s normal, in fact preferable, to go to work, school, shops, cafes, pubs, anywhere you like, by bike. Of course when you get back to blighty you’ll find the same old surfeit of good words in policy documents, bigging up bike use, backed up by the same old risible budgets that’ll barely stretch to the white paint people will park on anyway. And so the wheel turns. But is that finally about to change? It’s Londoncentric. From our point of view in Witney it could be just a tsunami sized wave. One that’ll deposit us alongside the long suffering Coyote. At the foot of a colorado canyon. Staring up at a cartoon puff of smoke. Beep! Beep! Roadrunner gets the last laugh again. 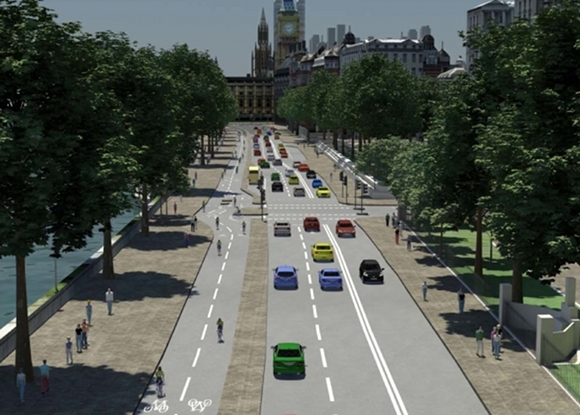 The section along the Victoria Embankment is what’s represented in the cover image, and I can actually imagine my mum riding along it, or a family with kids, without having to wait for that one day of the year when the Sky Ride takes place. In fact, the Sky Ride doesn’t use this particular part of the embankment anyway. 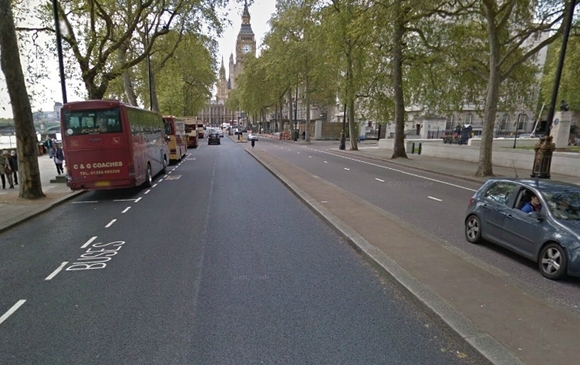 Here’s what it looks like now with only a painted cycle lane on the eastbound side. “I will more than double London’s cycling budget – to a total of almost £400m over the next three years, two-and-a-half times more than previously planned. In 2015, we will be spending £145m a year on cycling, or roughly £18 a head, up with the best in Germany and almost on a par with the Netherlands. Money. On a scale that’s way above anything we’ve seen before in the UK. Some are still questioning whether it’s enough, but compare that to Bike Safe’s investigation into the transport budget for bikes in Oxfordshire. My back-of-an-envelope calculation reckons it to be about 50p per head per year, most of which is spent in Oxford City. Like I said, a risible budget that hasn’t a hope in hell of tackling obesity, congestion or pollution. If Boris actually delivers what he’s promising for London, a guy seen as the clown of politics, what could the ringmaster do for us? Why don’t we ask him? Write to your MP and ask him why Oxfordshire County Council isn’t creating a cycle network in his Witney constituency like what Boris is doing for London. Let’s see how far we can ride this wave. Bip Bip et Coyote ( Road Runner ) from road.runner92 on Vimeo. This entry was posted in WitneyBUG and tagged bikes, infrastructure, london, planning, politics, witney, words on Fri 8 Mar 2013 by kevin hickman.